(SPOILERS) I’m not averse to remakes so long someone has a good reason for going there. Generally, I wouldn’t regard “It was in a foreign language” as a valid motive. Just occasionally however, even a straight retelling can provide the lazy distraction of a different-but-the-same iteration, although one invariably ends up reaching the same conclusion; why did they bother? Most of non-English language films picked by Hollywood for a remake fail at the box office, and yet the lesson is never learned. If there’s a whiff of a name property, even from a somewhat insular bean counter standpoint, something with any chance of audience recognition, that’s enough. 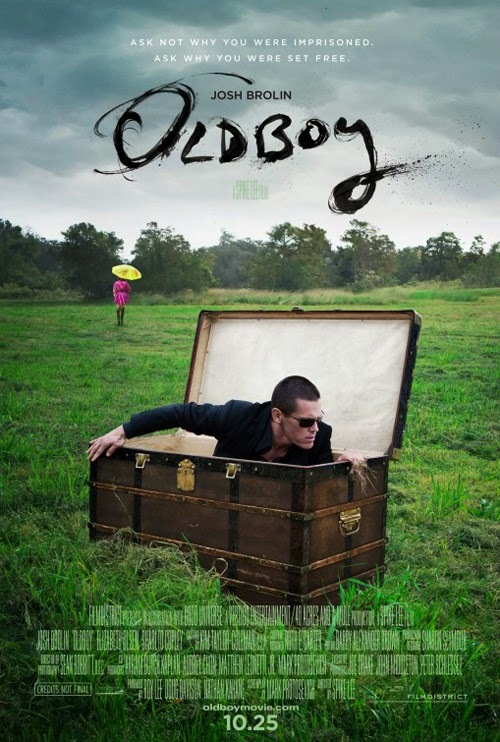 I seem to be in the minority with regard to the original Oldboy, as it didn’t do very much for me. Some bravura sequences and a compelling premise aside, I was became increasingly disenchanted as it became progressively more ridiculous and hysterical (and not as in funny) during the final act. It doesn’t surprise it took the Grand Jury Prize at Cannes, as it’s just the sort of material an excitable Quentin Tarantino would fall for hook, line, and sinker. Consequently, my lack of veneration probably left me at least vaguely open to someone else’s take; perhaps the issues I had would be approached differently? That someone, after many fall starts, turned out to be Spike Lee. He makes a few cosmetic changes, but ironically (given how wired Park Chan-wook’s movie is) the sombre, disengaged, tone proves to be OIdboy 2013’s undoing, further underlining just how unlikely and far-fetched the scenario is. And with that, the fundamental intention, the emotional punch line, is swept away. Lee at least warrants the benefit of the doubt. The released movie is not his preferred version, as producers lopped off 35 minutes against his wishes. It’s possible that in its unexpurgated form it’s a really good movie, and that the pacing really clicks. But his Oldboy seems long and listless as it is, unable to find its groove. Additionally, a longer edit wouldn’t fix core problems with the narrative. I suppose there might be an element where it’s explained that hypnosis has been used used to ensure Joe (Josh Brolin) and Marie (Elizabeth Olsen) fall in love… But that’s a wholly unpersuasive element of the original movie; I suppose it at lease evidences the makers were aware of the disconnect in their plot, but mostly it shows they had no idea how to make sense of it. Here, Joe and Marie fall for each other through an engineered coincidence, and we’re asked to swallow the idea that the rampantly affected Adrian (Sharlto Copley, whose performance kicks and strains against the dour tone while being simultaneously quite uncompelling) brought his plan to fruition by cajoling her through a troubled foster environment. We don’t believe it for a second, and it makes the climax all the more misconceived and dismissable. If, rather than breaking down and begging for death/Adrian not to tell Marie, Joe had been dumbfounded that such a cockamamie plan had actually worked, the makers might have at least shown self-awareness. This version is based directly on the 2003 film, rather than the Manga (as originally intended when Spielberg and Will Smith briefly flirted with the property). The thrust in both film versions is that something meaning nothing to one person, a youthful foolishness, leads to irrevocable consequences for another. But the alterations made by Lee and writer Mark Protosevich (something of a remake man; with Poseidon and I Am Legend behind him, inspiration is clearly not his forte) serve to cast an even harsher light on the original’s shortcomings. Changing the relationship that leads to Adrian’s actions adds symmetry and ick factor, but it is correspondingly less believable that young Joe never heard about the consequences. The rise of Adrian, a billionaire no one has ever heard of, including Joe’s school chum Chucky (Michael Imperioli), who hasn’t spend 20 years locked in a room, is also difficult to countenance. Luminous and lovely as she is, Olsen’s acting talent can’t overcome the problem with Marie any more that she could sell Elle Brody in Godzilla. Olsen is stuck with a character of incoherent and unbelievable motivation, a cypher created to fulfil a plot point. Whatever my opinion of Park’s film as a whole, the filmmaking skill is undeniable. On the most surface level, the corridor fight scene has justifiably become a legend in its own right. Lee refits it here and, while there is some excitement from seeing this kind of one shot (well, a few more, since its split level) choreography, it’s diffused by the weakness of opponents who only ever pull their punches in order to make the sequence flow. Better is the savage beat down of a football squad just after Joe is released. And the exit from solitary itself, via a trunk in the middle of a field, retains a surreal splendour unfortunately lacking elsewhere. Joe’s incarceration has its moments, such as hallucinating the bellhop picture on the wall come to life (played by Cinque Lee, Spike’s brother, this is surely a nod to his role in Mystery Train 25 years ago). Samuel L Jackson works with Lee for the first time since Jungle Fever, and his performance as Chaney, Mohawk aside, would blend in seamlessly with pretty much all his shouty roles of late. Joe’s torture of Chaney is wince inducing, but reflects the movie as a whole; impersonal, functional, efficient filmmaking that looks accomplished and has the occasional flourish but fails to make the viewer care about what happens. The final scene also departs from Park’s original. Lacking the hypnosis angle, Joe sees justice for what he has done as re-interment in his motel room. At which point he smiles. Conceptually, it’s a neat and effective choice, but to have resonance Lee and Brolin need to translate the horror at Joe learning of what he has done. And they can’t pull it off. Perhaps that’s why Park opted for such insane excess. Brolin is fine; moody and taciturn, he lacks iconic presence of Min-sik Choi; perhaps he needs roles with more differentiation or flair to make an impression, as he isn’t sufficiently commanding on his own. This is one of Lee’s few overtly studio-minded movies, following Inside Man seven years ago. It’s ironic then that it’s proved to be one of the biggest stinkers of his career (up there with Miracle at St. Anna in terms of budget far exceeding box office). It’s difficult to see how anyone thought a picture with such a grim twist would ever be more than a cult property in the US to begin with, and therefore probably not a smart idea to throw big (-ish) bucks its way. All the handsome production values in the world can’t justify this movie’s existence any more than the similarly pointless Let Me In a few years ago. That, at least, retained many of the original’s strengths. Oldboy only goes to confirm its predecessor’s weaknesses.